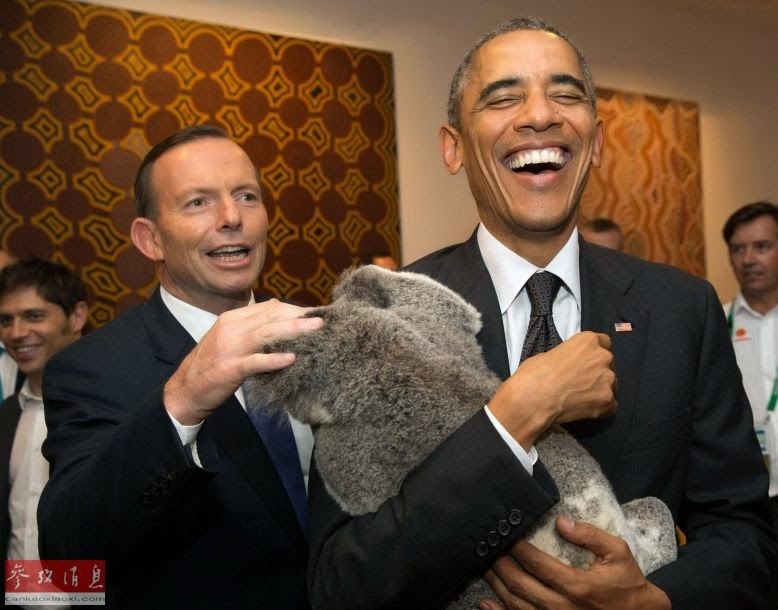 Recently the G20 Conference was held in Brisbane. Kilometres of steel barricades were erected and streets were closed off to protect visiting dignitaries from Brisbane's nasty protestors. I can only recall one arrest though - largely because most Brisbaneites treated the whole exercise as a big yawn. 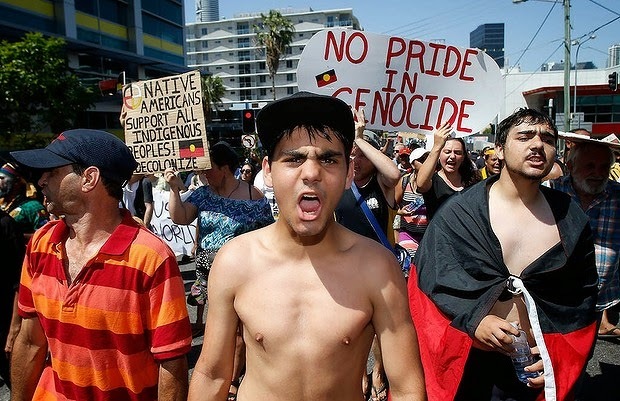 There was an indigenous protest march, but apart from the burning of an Australian national flag which attracted negative attention, the march was peaceful and uneventful. The early planning details released to the public concentrated so heavily on the security aspects of the G20 that Joe Average in Brisbane decided that the best course of action would be to pack up and leave town for a few days. The Gold Coast and Sunshine Coast accommodation and entertainment venues were even busier than their normal peak times of Christmas and Easter, while Brisbane businesses lamented the impact on their annual profits rather than "reaping the economic benefits" of the G20 as was promised by various politicians. 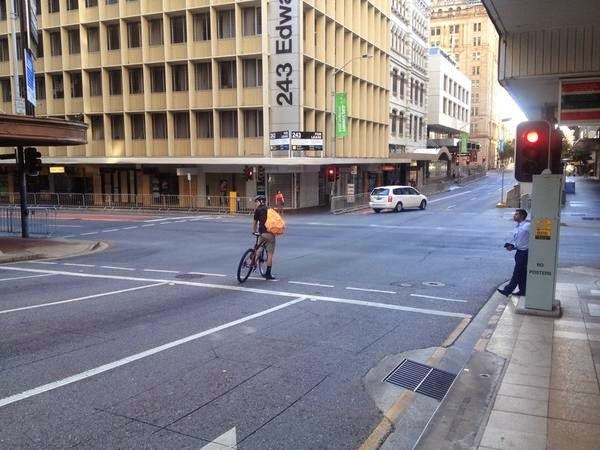 Here is a photo showing a cyclist with the streets to himself, and below that a group of police protecting a deserted street. When the planners and organisers realised that Brisbane was going to be a ghost town they implored people not to stay away from the CBD but to carry on as normal. Too little, too late. Apart from Germany's Angela Merkel who visited Brisbane's famous pub nirvana, Caxton Street, all that the world's other leaders would have seen of Brisbane would have been a sterile cityscape with no inhabitants. 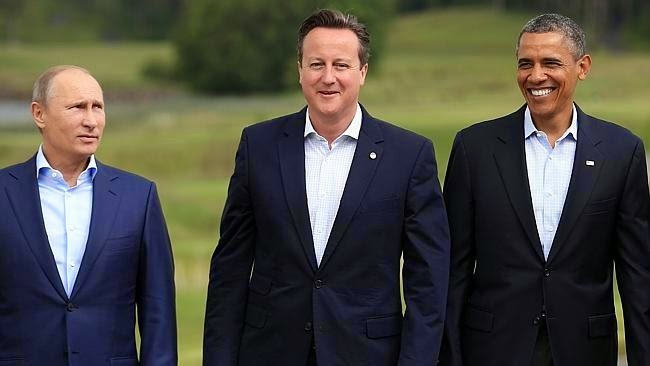 when it came to reporting on the three top dogs: Obama of the USA, Putin of Russia and Cameron of the UK. The itineraries of these and other leaders were cloaked in mystery and their motorcades swept through deserted streets as if pursued by the devil himself. The last time a visiting US president came to town things were the same yet different. Lyndon Baines Johnson had a one-night stopover in Brisbane on Saturday 22 October 1966 as part of a whirlwind three-day visit to Australia. Johnson had served in Australia during WWII, and in hindsight the 1966 visit seems to have been somewhat of a series of meetings where Johnson was able to reminisce about those days and catch up with acquaintances of that time. 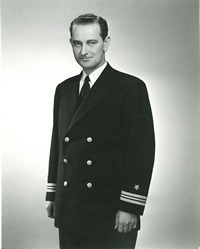 Here is a WWII picture of Lyndon Johnson in his naval uniform. 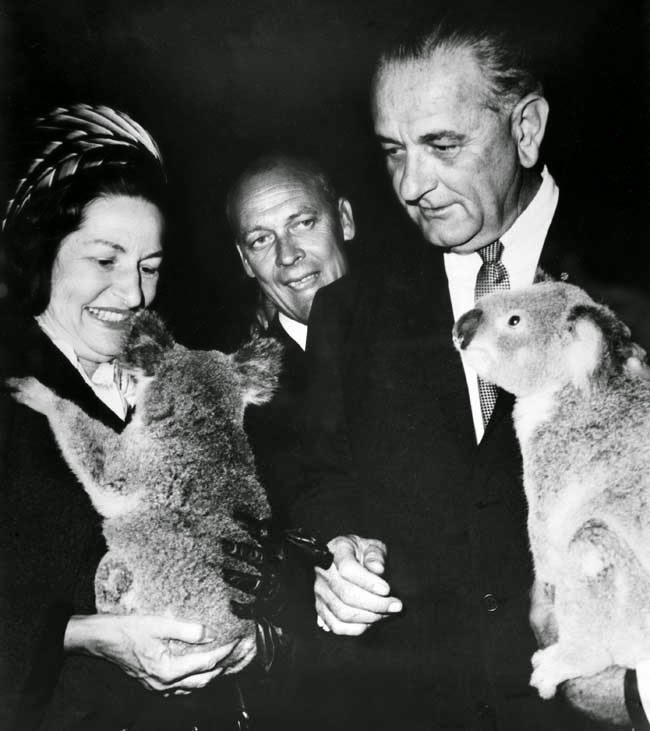 Whilst in Brisbane he and the first lady Lady Bird Johnson did find time to visit Lone Pine Koala Sanctuary, and the opportunity to cuddle a Koala was also on offer to the G20 visitors. Of course there were also overseas conflicts to muddy the waters. The G20 delegates had to tread warily around the wars in the Middle East and Ukraine, whilst the Vietnam problem was a major talking point for Lyndon Johnson. 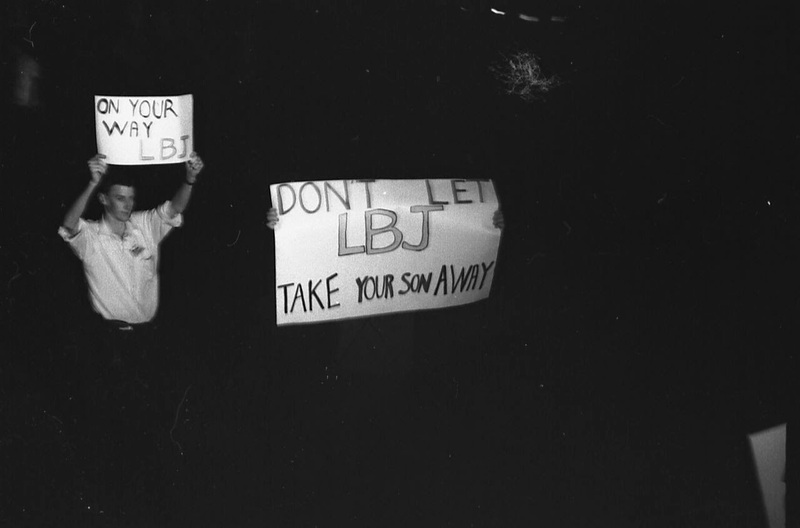 In Brisbane as in the other venues there were pockets of protestors decrying the war and conscription. But largely people were curious about the man who had succeeded JFK and launched his own triple-letter identity into history. In those less security conscious times the police were involved more in crowd control than arrests. 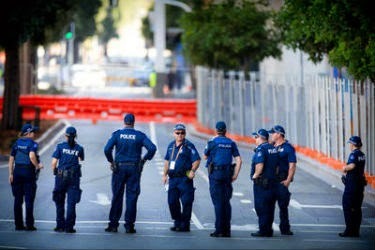 The photo below shows both uniformed and plain-clothed police with linked arms keeping the Brisbane crowd at bay. Huge crowds greeted Johnson when he arrived at Brisbane airport and at every part of his Brisbane itinerary. Despite the ever-present secret service detail, Johnson stopped the presidential limo on many occasions to interact with Australians - even at times rolling back the perspex roof to enable handshakes. His destination for the evening was Brisbane's top pub of the time, Lennons Hotel in George St, where his limo was surrounded as if he were a rock star or royalty. 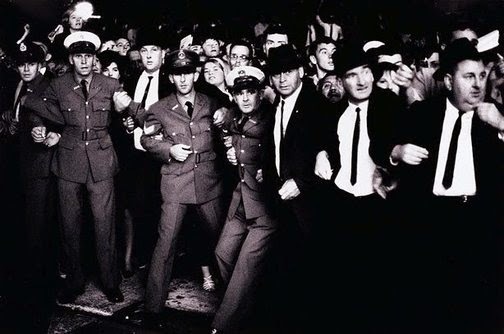 I was in the crowd outside Lennons that night, largely because I was just finishing my final year at high school and was out having some fun with my friends. The crowd was warm and well-behaved until Johnson's car arrived and then pandemonium ensued - in a good way. Click here to see a film of Johnson's visit from the National Film and Sound Archive of Australia. Unfortunately the Brisbane segment starts at 22:04 and is only a rather brief showing of arrival and departure together with some street scenes which seem to be around the Clayfield area. Australia's prime minister Harold Holt, fresh from his famous "All the way with LBJ" war cry, chaperoned the US president around in what was the first ever visit to our shores by a serving US president. Unfortunately Johnson was also to make the second visit to Australia by a serving US president when he returned in a little over twelve months time to attend the memorial service for Holt who drowned at Portsea while on his Christmas break. Did you see The Great Australian Race Riot series on SBS television? I had already written about Peekskill Riots in the USA in 1949 when the SBS programme prompted me to be more even-handed about Australia's less-than-lovely views on racism. Next Saturday this new post on the ugly Red Flag Brisbane Riots of 1919 will be published. Now I have to ask you, why Brisbane? It was not a large city in 1919, not crowded, not more impoverished than other cities, hardly more cosmopolitan in its migration practices. I missed the televised program but I was able to call it up on SBS On Demand. At the time of the riots Queensland had about two-thirds of Australia's Russian migrants. Not many of them were Bolsheviks - mostly they were devout Orthodox Christians or Jews. Perhaps because of numbers the perceived threats of stolen jobs and different faiths were more evident here. Why Brisbane? I can't answer that as I believe that xenophobia exists everywhere. The trouble with mobs is that truth very quickly becomes distorted, logic goes out the window and a pack mentality develops. It always disappoints me to see how quickly one human being can despise another because of differing faith or skin colour. I have touched on the Red Flag Riots and the perceived Russian threats in a couple of pieces here. I am looking forward to your post.